It is time to celebrate all things cheesy. 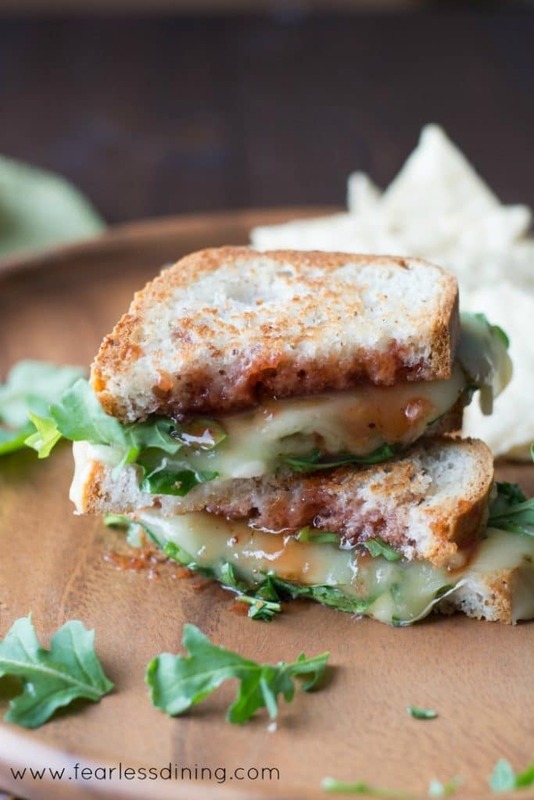 This Gluten Free Pepper Jack Grilled Cheese Sandwich with a Strawberry Hot Sauce and Arugula is my new favorite craving! If you love lots of cheese, with a fun spicy twist…this is the sandwich for you! Grilled cheese sandwiches are a staple in our house. Everyone in my family loves anything based on melty cheese :-). You may look at my ingredient list and wonder about this grilled cheese recipe. You have to understand that I love food chemistry and flavor combinations, and I promise I would never steer you wrong. You will have to trust me on this grilled cheese recipe. It is so worth making. The sweetness of the strawberry jam just “works” with the peppery finish of the hot sauce and arugula. The cream cheese adds the creaminess mouthfeel and the flavors create a party in your mouth! I am not only celebrating this special “foodie” day, but I wanted to talk a little bit about giving back. If you have been reading my blog for a while, you know I used to work in the non-profit realm as events and fundraising person. Even now that I am no longer working for a non-profit, our family is still very active in volunteering. The Smart & Final Charitable Foundation supports four important areas – health and wellness, education, hunger relief, and team sports and youth development. The Foundation gives to nonprofits in California, Arizona and Nevada where the company has stores. And what better way to support this cause then to shop and get these tasty First Street ingredients to make this pepper jack grilled cheese sandwich! As always, Smart & Final guarantees all of their First Street products with a “try it and you’ll like it” or your money back guarantee. For my recipe, I found all sorts of great First Street products to use. Not only does Smart & Final carry over 2,000 First Street products, but they also have a lot of gluten free brands, fresh organic produce, and even cleaning products. To create this easy grilled cheese sandwich recipe is so easy! First, we want to create the strawberry hot sauce. Just combine the strawberry jam and cayenne pepper sauce in a microwave-safe dish. Cover and heat. Heating the two together help mesh the flavors together. Do this first so it has time to cool off. Heat a pan and coat one side of the bread with butter. Spread on cream cheese and add pepper jack to one slice, then spread the special strawberry hot sauce on the other. Add another slice of pepper jack then top the one side with fresh arugula. Finish heating then blend the two halves together. This grilled cheese is super cheesy and delicious! Another thing I love about Smart & Final are the prices. Warehouse prices so I save money. It is so easy to get all of the ingredients I need for this perfect grilled cheese sandwich. Easy pepper jack grilled cheese sandwich recipe. 1-2 teaspoons cayenne hot sauce, depends how spicy you like it! In a microwave safe dish, combine strawberry jam and hot sauce. When the pan is hot, put the butter side bread down on the pan. Spread cream cheese on one side and the jam on the other. Cover each with a slice of Pepper Jack cheese. When the cheese gets a little melted, add arugula. Remove sandwich halves from the heat and put together. Serve warm while the cheese is melty. What do you like to put on your favorite grilled cheese sandwich? I already can anticipate the taste! It reminds me of a dish that I already make and love…fried Camembert with jalapeño jelly. Yum! Can’t wait to try this! That jalapeno jelly sounds really good. I need to find that! Love that you made a strawberry hot sauce! That sweet/spicy/cheesy combo has my mouth watering! This is one crazy delicious looking grilled cheese! Love that addition of sweet and heat…yum! This sandwich is simply genius! The combo of spicy and sweet… I HEART it! What a wonderful combination! I have never thought of a sweet and spicy combination unless it was an Asian inspired dish! This looks just so good! Strawberry hot sauce? I am so intrigued with this flavor combo!! Oh my goodness, yes please!!! These look amazing! Love the strawberry hot sauce. Enjoy 🙂 Thank you for stopping by the blog. Strawberry hot sauce!? I’m intrigued. And drooling a little. Mostly drooling, though. This sandwich looks amazing! I can’t wait to try this with dairy-free cheese options and fresh homemade GF bread. I’m sure it will be scrumptious! Doesn’t Daiya make a dairy free Pepper Jack? Pepper jack is my favorite for grilled cheese! LOVE the strawberry hot sauce idea! Oh wow, I am drooling here! That Strawberry hot sauce, I think I’m in love! Sweet and spicy is my fave combo, add cheese and I’m SO THERE! I love sweet and spicy too 🙂 Hope you get a chance to try this out. It doesn’t get better than a delicious melty grilled cheese! I love those flavors! This grilled cheese looks delicious. I had no idea it was National Grilled Cheese Day, thanks for letting me know. Oh-so tasty! Great sandwich! Good to know about Smart & Final — I wasn’t aware. I used to work for nonprofits, too, also in fundraising ;). Oh wow, that looks so amazingly cheesy!! One amazing grilled cheese! I thought I had tried the best grilled cheese already! That strawberry hot sauce looks amazing! What a perfect blend of heat and sweet! Wow. I’m a total grilled cheese nerd and all those flavors sound amazing together! This sandwich sounds amazing! I love the sweet and spicy flavors and ooey gooey cheese is always yummy!